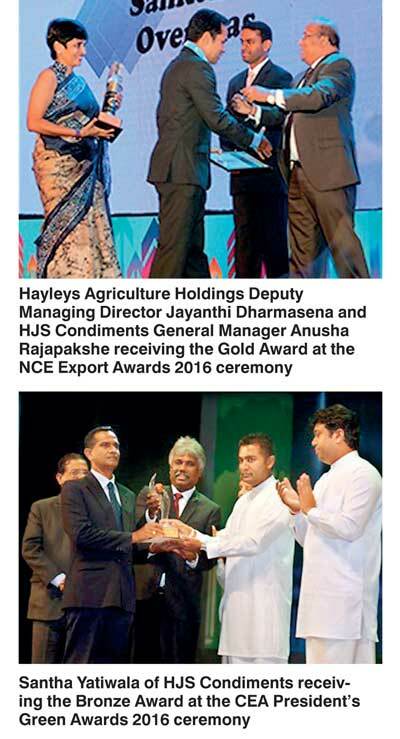 HJS Condiments Ltd. the key Agri Export division of Hayleys Agriculture Holdings Ltd., won the Gold award under ‘Agriculture Value Added Sector – Large Category’ at the National Chamber of Exporters (NCE) Export Awards held recently. HJS was also awarded Bronze in the Food and Beverages Category at the Presidential Environmental Awards Ceremony 2016 hosted by the Central Environment Authority. “It is truly an honour to receive these prestigious awards as we have worked hard for over 20 years providing leadership to the value added fruit and vegetable exports sector, and we wish to inspire all stakeholders in this domain to strive for the best which would enable Sri Lanka to gain international recognition as the most preferred source for Value Added Agro Products,” said HJS Condiments Ltd. Director/CEO Ananda Pathirage. Hayleys Agriculture has been spearheading the Agricultural sector in Sri Lanka since 1950’s. Being among the top ranked firms in the region, Hayleys Agriculture is renowned for its wide array of innovative and sustainable agricultural solutions that caters to the entire agri value chain and its aquaculture, high-tech horticulture and bio technology products. The sector’s value-added agricultural exports to major buyers in the international arena contribute to over 45% of the processed fruits and vegetable exports of the country. Hayleys Agriculture envisions becoming the region’s leading Integrated Sustainable Agri Solutions Provider and Advisor. In addition, Hayleys Agriculture constantly strives to innovate commercial agriculture for food security, environment sustainability and welfare. HJS Condiments is the largest processed fruits and vegetable exporter and accounts to over 45% of value added fruit and vegetable exports from Sri Lanka. HJS is the pioneer and sole processor and exporter of pickled gherkins and currently export to over 42 countries around the world. HJS supplies its range of products to supermarkets, departmental stores and fast food chains such as McDonalds, Burger King, Subway, and Hungry Jacks as well as multinational FMCG companies such as Nestle and Unilever. HJS is strongly present in the Asian, Middle East and European regions and accounts for over 60% market share for bottled pickles in the Japanese market. Apart from pickles, HJS also processes tropical fruit products such as pineapple, mango, papaya and banana either in cans/jars or in a dehydrated manner and in organic form. HJS production facility and systems are certified under stringent food safety, quality management, environmental management, health and safety and social accountability standards. Moreover HJS processing factories are recognised among the finest water and carbon conscious facilities. HJS also maintains the largest out grower network, of over 15,000 farmers for fruits and vegetables, and support the diverse agriculture communities in the country by sharing knowledge free of charge through a range of R&D and farmer training initiatives whilst constantly promoting better use of technology and sustainable agricultural practices.